Actions/Intentions: The action verbs the actor uses to fulfill the Objective/Driving Question. i.e. to possess. Activity: A specific physical task that may or may not be connected to an action, such as a character loading a gun or packing a suitcase. Ad-Lib: Spoken words (sometimes witty comments) said out loud that are not in the script. They can also be given “off the cuff” when another actor forgets a line. Adjustment: A direction or modification an actor makes in the playing of material. They are often instructions given by the director. Affective memory: (Or “Remembered emotion”) Memory that involves the actor personally, so that deeply rooted emotional experiences begin to respond. His instrument begins to awaken and he becomes capable of the kind of living on stage which is essentially reliving. Animal work: Sensory and body work based on the observation of animals, birds, and reptiles. Apron: The area of the stage in front of the proscenium arch. Arena: A type of stage where the audience is seated on three sides (also referred to as Thrust). Aside: A character’s comment or observation, often delivered directly to the audience or themselves. Beat: 1. A component of spoken material with a single action. A new beat occurs when the character changes what he is doing to attain his objective. 2. In blocking, holding for 1 second=1 beat. Blocking: To set the movements of actors on a stage or set. Also, any given movement that enhances the scene, such as a specific character gesture. Central conflict: The oppositional force between characters that directly affects or motivates the action of the plot. Characterization: The actor using their craft to explore and develop the specific qualities of a character. Cheating or Opening Out: Angling or squaring the body out toward the audience or camera, while still partly facing the other actor/character. Cold Reading: Unfamiliar material, such as a scene or audition sides. An audition in which you are asked to read from copy you are not familiar with, generally with little or no time to prepare. Composition: The arrangement of the staging and design elements to create a visual picture. Conflict: An essential and vital element of acting that involves the obstacles and struggles (inner and outer) that a character must overcome to reach their objective. Countering: A blocking movement by an actor to rebalance the stage in reaction to another actor’s movement, or change of position. Cue: The action, line, or phrase of dialogue that signals your character to move or speak. Cue-to-Cue: A tech rehearsal where to save time, action and text is cut out between cues. Dialogue: The written words spoken by the actors/characters. Downstage: The front of the stage or the part closest to the audience. Dramaturge: A profession in theatre that deals mainly with the research and development of plays. The dramaturge often assists the director in the preparation of a production. Dry tech: The rehearsal and setting of lighting, scenery, and sound cues, in preparation for the full technical rehearsal with actors. Emotion: The agitation of feelings such as sadness, power, fear, love, hate, and joy. These can be followed by responses such as rapid heartbeat, crying or shaking. Emotional Recall: (or Emotional Memory) The emotions from an actor’s memory (long or short term) of personal experiences that are used to connect the actor to the character, and meet the emotional needs of the situation in the play or film. Endowment: To give physical or emotional attributes to your character, to create more reality and meaning to further the needs of the story. Objects can also be endowed with physical, emotional or historical attributes: shaving without a blade, removing wet clothing when it’s not wet, drinking water as if it’s vodka. Fourth wall: The imaginary wall which separates the actors from the audience, and the audience from the stage. The actor uses it to create the reality in the scene, and keep one’s mind in the world of the film or play. Framing: Crafting and sculpting individual moments for the purpose of highlighting them. Given circumstances: The background and current circumstances of a character, ranging from who you are, where you are, and why you are doing it. The costumes, sets, and lighting—all the circumstances that are given to the actor to take into account as they create their role. Group Theatre: Founded by Harold Clurman, Cheryl Crawford and Lee Strasberg in the 1930’s, the Group Theatre based its acting on the innovative teachings of Constantin Stanislavsky. A renowned American theatrical company whose members included: Lee Strasberg, Stella Adler, Bobby Lewis, Sandford Meisner, and Harold Clurman. The company was based on an ensemble approach to acting as first seen in the Moscow Art Theater, and changed the course of American theatre forever. They created new American plays with a vision that spoke to and reflected the common man and to change the troubled times. The traditions of the Group Theatre are continued to this day. Happiness: (also called The Super Objective) The character’s long term objective or “big dream” in life. The “happiness” does not necessarily apply directly to any single scene but has an effect on every scene. It also helps in providing conflict and dimension to every scene. Improvisation: Setting out to do a scene with no pre-planned or written idea. A process leading to spontaneous discovery that allows the actor to find real, organic impulses within themselves. Impulse: A natural response that an actor responds to in the moment. Indicating: Showing what your character is feeling or doing without really feeling or doing, leading to a false and shallow performance. Inner Action: A physical action verb chosen by the actor in the pursuit of an objective. It always begins with the word “to” i.e. to attack, to soothe, to tickle. Inner Life/Inner Monologue: A character’s active, imaginative inner thoughts while the actor is playing a role. Instinct: A compelling or powerful impulse. Instrument: The actor’s collective working of the body, voice, mind, and imagination. Intention: Another word for an acting objective, or action, that an actor pursues while onstage. Meisner Technique: An acting program that uses (among other things) repetitive and in-the-moment exercises first devised by Sanford Meisner of the Group Theatre. The technique emphasizes “moment-to-moment” spontaneity through communication with other actors to generate behavior that is “truthful under imaginary circumstances.” Meisner also emphasized using the actor’s imagination to create emotional reality—the creative “as-if”— over the personal, emotional experience philosophy championed by fellow Group Theatre member Lee Strasberg. Moment-to-moment: The acting process concentrating on the present, not what’s going to happen in the future. Monologue: An uninterrupted speech by a character in a performance. The monologue may be to another character or the audience. Moscow Art Theatre: Co-founded in 1897 by Constantin Stanislavsky with Vladimir Nemirovich-Danchenko. The theatre was conceived as a venue for naturalistic theatre, as opposed to the melodramatic style which was popular in Russia at the time. Motivation: The Why? The reason a character pursues a particular objective or super objective. Objects: Physical items used by the actor to enhance and give more reality to a character. Objective: A character’s pursuit of a specific goal in a scene. Also referred to as the intention or driving question. Obstacle: The conflict and stumbling blocks to a character’s struggle in pursuit of an action or objective. Organic: A natural response that comes (organically) from deep within the character/actor. Pace: The speed at which you pick up your cue and deliver the next line of your dialogue. Pace can also be the speed that creates a style for the piece. Physical gesture: A specific movement or physical action of a character that expresses the psychology, feelings and desires incorporated into one gesture. It is often used by the actor to awaken the essence of his character. Particularization: The process Uta Hagen taught, making each event, person and place (down to the smallest physical object) as exact as possible. These details are explored in great detail to discover how they are relevant to the character. Physicalization: To express with the body. Showing as opposed to telling. Externals of a character, such as how they eat, walk and talk. Presentational: An actor’s awareness of the audience through direct address to the audience, by looks, signs or gestures. Psychological gesture: If we define gesture to mean a movement that has intention, we could say that the Psychological Gesture is a movement that expresses the psychology of the character. Props: All objects on a theatrical or film set, used by the actors. Hand Props: often small and hand-carried objects used by actors during performance, i.e. glasses, wallet, handkerchief. Practical Props: props that actually have to work during performance, i.e. cigarette lighter, flashlight. Representational: Represents “realism.” Characters in their real lives that are not aware the audience is there. Run: 1. A series of brief lines building to a speech or key moment. 2. The number of performances a show does. Script Analysis: The close study of a play or screenplay. This incorporates all of the dialogue and stage directions to find the answers necessary to create a full and rich character and to craft a performance that serves the script. The exploration of the script may include the questions of theme, story, character, and overall elements of the play and characters. Sensory: Connecting the character to the body and mind through the senses; to taste, hear, feel, see, think, perceive; to know through the physical inner self, as opposed to the instinctive. Sense memory: (emotional recall) The basis for Lee Strasberg’s Method Acting. “Sense memory” is used to refer to the recall of physical sensations: sight, touch, taste, smell, and sound. These physical sensations surround an emotional event, instead of the emotions themselves. Sides: A portion of a script (pages) selected for an audition that highlights a specific character. Soliloquy: A speech given directly to the audience, ordinarily with no one else on stage. Usually played as a direct address to the audience, sometimes played as a character thinking aloud in the audience’s presence. Spontaneity: A free unplanned impulsive moment. Stage Business: A stage activity used to accent, intensify, or heighten the manner in which one uses an object on stage. Stage Directions: The writer’s insertions of blocking, reactions, gestures, or use of props to clarify the action. Staging: The final results of blocking—Alternatively called blocking. Stage Left: In a proscenium theatre, the actor’s left, while facing the audience. Stage Right: In a proscenium theatre, the actor’s right, while facing the audience. Stakes: The heightened consequences for each character of achieving or failing to achieve their objectives. Stanislavsky, Constantin (1863-1938): Russian theatre director, actor, and teacher most responsible for the manner and technique in which the craft of acting is taught. Co-founder/director of the Moscow Art Theatre in 1897 with Vladimir Nemirovich-Danchenko. He developed a “system” or “method” by which actors could consistently produce superior work by tapping into themselves and their real feelings, to create naturalistic acting as opposed to the representational acting style popular at the time. Strasberg, Lee (1901-1982): Acting teacher, artistic director of the Actor’s Studio, and developer of what came to be known as “Method Acting,” an approach based on early writings of Stanislavsky. His teaching method was based on Stanislavsky; but, among other things, Strasberg intensely focused on actors exploring past memories to use real emotions to connect them to their character. Subtext: The character’s complex thoughts, feelings, motives, etc. created and layered under the actual words and actions of the character by the actor. Substitution: The recasting of people, objects, and events in the script that the character must react act to, with real people, objects and events that the actor has known or experienced in their own life. Super objective: Stanislavsky developed the concept of the super- objective (referred to here as The Happiness) that would carry the ‘through line of action,’ mapped out for the character through the entire play. Tactics: “How” a character goes about achieving their goal. Also, specifically the way a character “masks” their inner action or intention, on the outside: i.e. to alarm (inner action) by freaking out (outer tactic). Tasks: Pieces of work or functions that need to be done, the total of which comprises an overall activity. Tempo; pace; rhythm: The level of speed with which the scene or play is acted out. The general effect creates a specific mood or tone to the work. Three-Quarters (Actually ¼): A stage position in a proscenium theatre, where the actor is facing half-way toward the actor to their side and half-way toward the audience. Thus the audience is essentially seeing a three-quarter view of the actor. Transference: Uta Hagen’s term for the actor’s process of making transferences from their own experiences to those in the play until they become synonymous with them. Trigger: An emotional or physical signal that signals or sparks a bonfire of emotion to break through to the surface. Upstage: The opposite of downstage; the back part of stage in a proscenium theatre; the farthest part from the audience. Derives from the eighteenth century, when the stage was slanted, or “raked” toward the audience, with the rear of the stage higher than the front. Upstaging: To go upstage of an actor with whom you are sharing a scene. This causes the other actor to be in the downstage, weakened position of having to face upstage to maintain the illusion of eye contact. Upping the stakes: Increasing and upping the importance on a scene or moment to heighten the dramatic tension of the character or scene. World of the play: What happens. Where it happens. When it happens. The circumstances affected by the society, economics, culture and politics of the time. What we learn from the setting of the play. ADR: (Automatic Dialogue Replacement) see looping. Cinematographer: The expert responsible for capturing, recording or photographing images for a film, through the selection of visual recording devices, camera angles, film stock, lenses, framing, and arrangement of lighting. Double: A person doubling for a principal actor usually for stunts (dangerous shots). DP: Director of photography, the head cinematographer. Eye Line: Eye line is the direction an actor should look off-screen to match a reverse angle or a P.O.V. (point of view) shot. It is best to give the actor an actual thing or spot to look at rather than a blank spot on an empty wall or an empty space in mid air. Extras: Actors hired for non-specific, non-speaking roles, to add background atmosphere and reality. First AD: The First Assistant Director. This is the director’s right hand man, who basically stage manages the entire set. Holding: The area or bus set aside for extras to wait between scenes. Key 2nd AD: The senior 2nd AD is responsible for having extras on set at the right time, blocking extras into crowd scenes, cueing of extras etc. Looping: The recording or re-recording of dialogue for a previously for filmed scene. M.O.S: A shot, a sequence, or a film that is shot without sound, which is added later. M.O.S. stands for “With Out Sound,” and derives from German director (Otto Preminger) asking for a shot to be filmed “Mit out sound,” which was written “M.O.S.” on the slate. Over the Shoulder: A camera shot of the scene shot from behind or “over the shoulder” of a principal actor, revealing what they are seeing from their point of view. Piggy Back: A camera shot with both actors involved, facing the camera one behind the other. The “piggyback” allows both characters to have their private thoughts about each other, while allowing the audience to see what both characters are thinking. POV: A shot that shows the scene through the character’s eyes. We see the world from their point of view. Reaction Shot: The camera shooting a character’s emotional or physical response or reaction to something that is happening in the scene. Reverse: A camera shot set up to shoot the reverse 180° view of the previous shot. Second AD: Second Assistant Director. On most sets there are many 2nd AD’s responsible for everything from crowd control, extras, parking, traffic control, security, cuing, and actors on camera. Second Team: Stand-ins for the principals involved in a specific scene. You will hear an AD yell “Second Team!” calling stand-ins on set to stand where the principals were, while the DP lights the scene and the camera operators rehearse their moves and focus. Stand-in: An extra hired for size and coloring to double for a principal actor for lighting and camera set ups. Video Village: The area where all of the camera shots are fed into video monitors, allowing the director to get an accurate view of every shot. VO (Voice Over): A recording that will either be added later or played back while shooting the scene. This course will cover the fundamentals of theater, especially improvisation, theater terminology, and acting technique. We will focus our acting to monologues, two-person scenes, and small group scenes. A live performance will be the final exam for the completion of this course. One semester. ½ credit. This course is an elective. It fulfills 1/2 credit of the visual and performing arts requirement. So, exactly what is improvisation? Improvisation is one of the core techniques used by actors. It stretches the imagination, sparks spontaneity and can lead to unforgettable performances. Should we throw away the script? Scripted work, of course, has great merits, and forms the basis for the majority of acting we are used to seeing, whether at the cinema or theatre. However, going “off script” can sometimes offer a moment of magic which cannot be explained – and that’s the point! 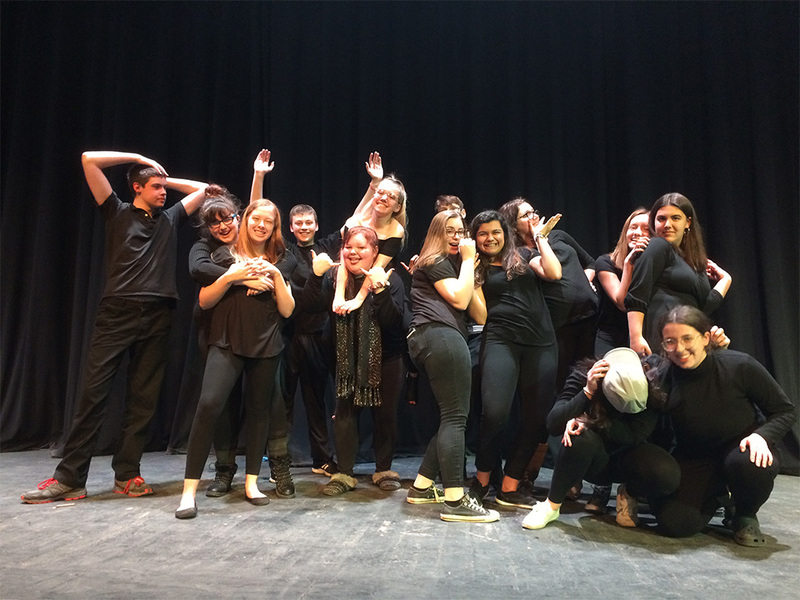 Unscripted, improvised theatre and comedy are both established art forms in their own right and are growing in popularity among audiences due to their high-energy and spontaneous moments of comedy. How do actors do it? Improvisation (aka acting improv) is not a new invention – actors have been using these skills for centuries. For example, Commedia dell’Arte, dating back to 16th century Italy, relied on improvisation for much of its storytelling. 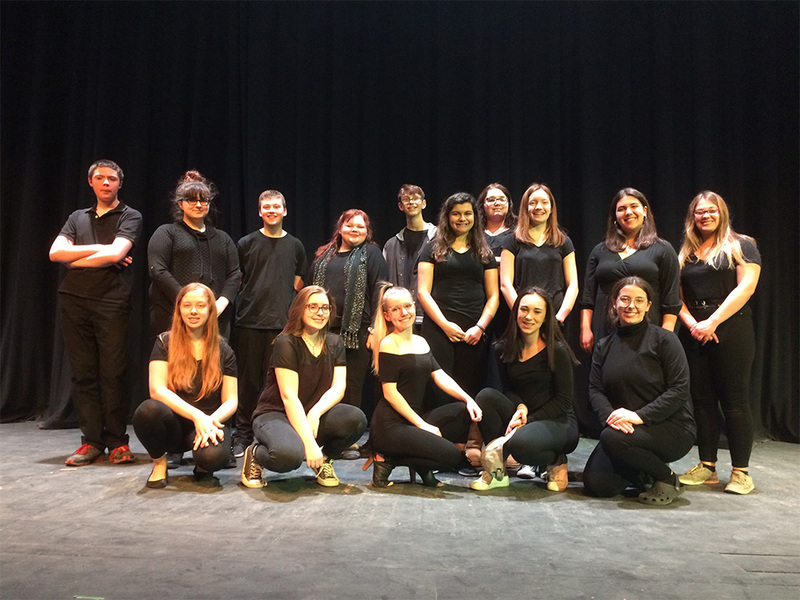 Improvisation is really an example of heightened communication, relying on an actor’s ability to engage completely with their fellow performers as well as their own character. Taking a character off-script and seeing how they react in different situations helps create a rounded character and can lead to more natural, believable performances. There are a number of techniques actors can develop in rehearsal to develop these skills. From playful games and exercises designed to ignite creativity, through to identifying ‘states of being’ to help ‘switch on’ energy and charisma. These are acting techniques which can be developed through practice and repetition. 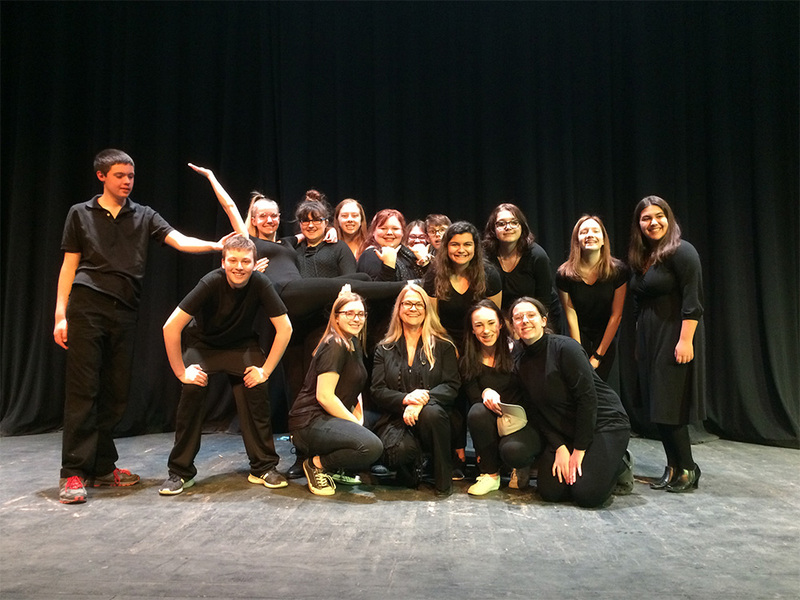 Jennifer Hunter, a faculty member of Lake Superior State University, explores how we can use improvisational comedy everyday to achieve a greater sense of self. Jenn Hunter is a director, teacher, actor and improviser from Portland, Oregon. She is currently teaching and directing at Lake Superior State University. She graduated with an MFA in Directing from University of Portland. Jenn has a degree in Fine Arts, a Masters in Education and has studied the Meisner Approach to Acting at The Neighborhood Playhouse in New York. Her performance credits include ComedySportz, Curious Productions, Brody Theater, and Anonymous Theater, and she was a proud company member of Theater Vertigo before her move to Michigan. This talk was given at a local TEDx event, produced independently of the TED Conferences. This performance was entirely unscripted, and unfolded before the eyes of our audience. With acoustic musical accompaniment and live painting on stage, our improvisers tell a story of love, loss, and mayonnaise. Rapid Fire Theatre, founded in 1988, is an improvised theatre company in Edmonton that performs weekly shows at the Zeidler Hall in the Citadel Theatre, as well holding several festivals that showcase local and international talent. Improv is performance, storytelling, and comedy that is inspired by suggestions from the audience. Completely unscripted, everything is made up on the spot, and will only ever happen once. The show is in collaboration with three and visual artists and BEAMS, Edmonton’s Boreal Electroacoustic Music Society, which has been dedicated to the production and promotion of sound-oriented experimentation. BEAMS uses the broadest and most inclusive definition of electroacoustic music, welcoming creativity in any medium.